The olive branch was used as a symbol of peace and victory in ancient times. Olive wreaths were awarded as prizes to Olympic victors. Olive oil, used throughout the world, is a nutritious and delectable choice for healthy eating. Use it now, rather than later, for freshness makes a difference. Olive oil can be burned for illumination in lamps and some cosmetics and soaps use it as a base. 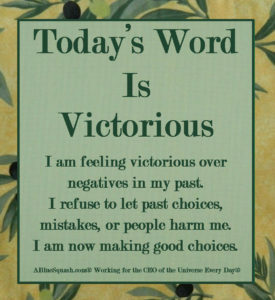 All of which are great reasons to use the olive and leaf as a backdrop in today’s feeling victorious image. One of the prizes for victory over moving past childhood or long-standing negatives is emotional health and a clean, light life. 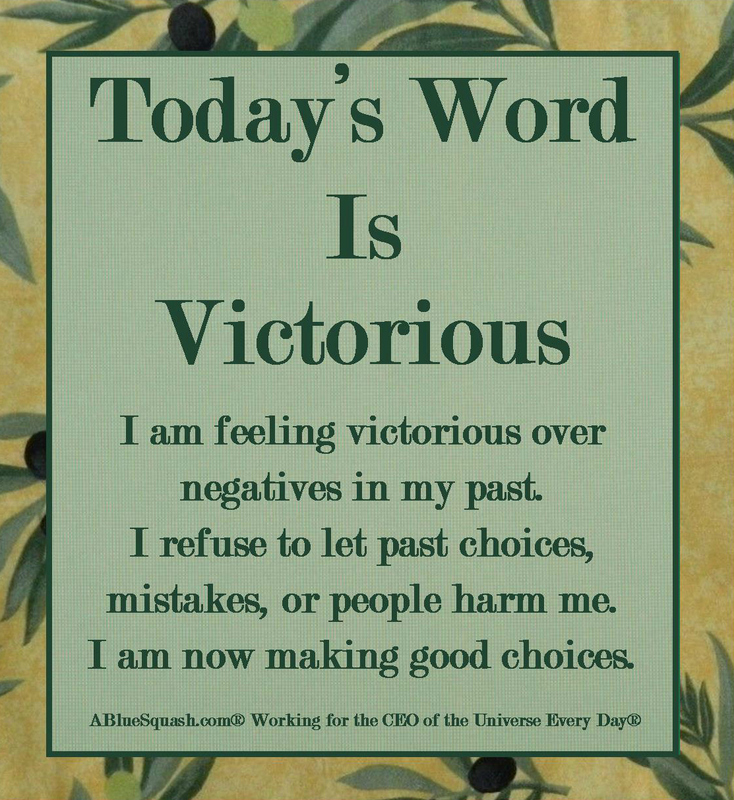 I am feeling victorious over negatives in my past. I refuse to let past choices, mistakes, or people harm me. I am now making good choices. 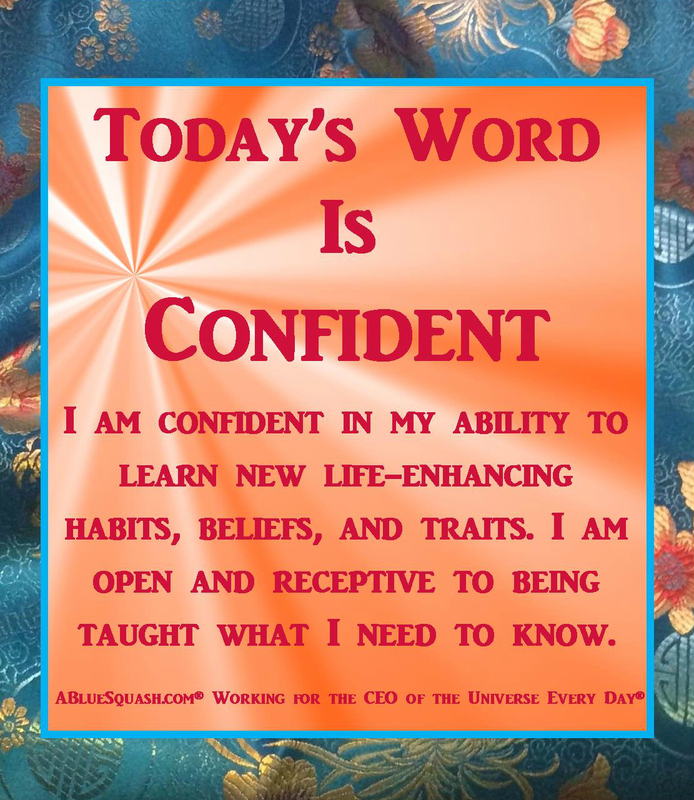 I am confident in my ability to learn new life-enhancing habits, beliefs, and traits. I am open and receptive to being taught what I need to know. 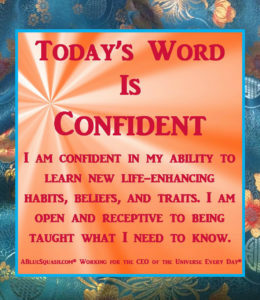 Confident is having a strong belief, being sure of oneself and one’s abilities, and having a likelihood of success. Trusting my inner voice assists in correcting my thinking. Trusting that the right reading materials, people, or doors of opportunity will appear to teach and train me in life-enhancing ways always works. Being open and receptive means I can be taught and won’t miss out on ways to improve myself. And that makes me feel confident. 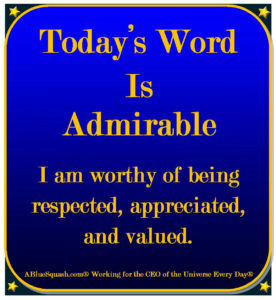 I am worthy of being respected, appreciated, and valued. The power is within me to be what I choose to feel. The power is within me to choose how I feel. Today I am feeling fantastic whatever the circumstances. Today is July 11th or 7 – 11. To some folks these are lucky numbers. Nevada was the first state to legalize gambling in 1931 and often times you can find souvenirs adorned with the numbers 7 and 11. Having lived in Nevada for decades, I’m very fortunate not to have caught the gambling bug. However, one thing I did learn when first moving here, there is no such thing as a lucky number. You can beg to differ with me and that’s okay, win or lose, it’s your money. Seven come eleven is a term used in the game of craps where a “natural” is a roll of two dice with a score of seven or eleven on the come out roll. If players wagered money on the “pass line” bet – they win. And that’s my extent of knowledge about the game of craps. What I do know about is luck. Did you know the definition of luck in Webster’s Dictionary is, “the force that seems to operate for good or ill in a person’s life, as in shaping events or opportunities; good fortune; success. I don’t believe in Lady Luck being “the force.” Although thoughts that other people were luckier than me persisted until what I think of as the true force, the CEO of the Universe, found me and lessons of the Law of Attraction (another force) were learned. I will reap what I sow and what I give out will return to me. BEING the person I want to be in my mind and my thoughts, asking with thankfulness and taking action, while releasing the outcome is a habit that makes me feel lucky. As I routinely ask to be open and receptive to the good and abundance of the Universe, good from unexpected sources pops into my life. It can in your life too. Let the Universe maneuver circumstances to give you good. Make life-enhancing choices that magnetize good into your life. Cooperate with the CEO of the Universe by treating people with love, respect and appreciation and step forward when doors of opportunity swing open. It worked and is working for me. My life improves for the better every day. 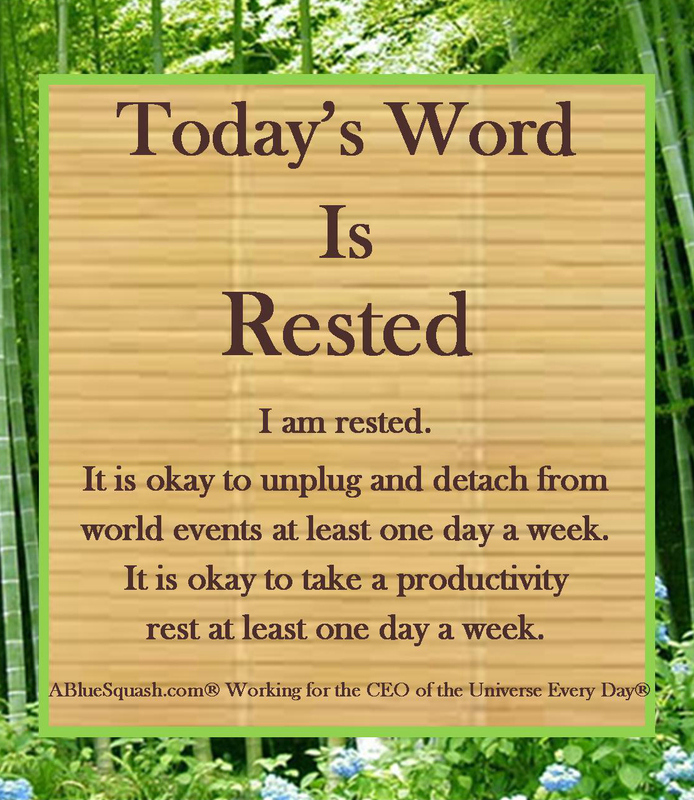 One of the best choices I ever made was to unplug and detach from world events and productivity at least one day a week. I decided Sunday would be my breather from everything outside my family and home. I refused to be afraid to miss out on anything. And guess what, the world didn’t stop turning because I wasn’t plugged in. Terrible events kept right on happening; however I wasn’t affected or infected by them. My mind, body, spirit and soul got healthier. Yes, I practice what I preach. 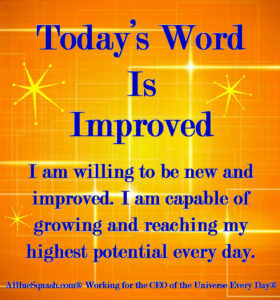 If you’re following 365 Days of Transformation One Word at a Time©, you’ll see the postings sometimes don’t get done every day. Until I figure out HootSuite or some other social media management tool, there are intervals between productivity. It doesn’t matter what day you pick, just pick one and try unplugging one day a week for one month. See how it makes you feel. It makes me feel rested. 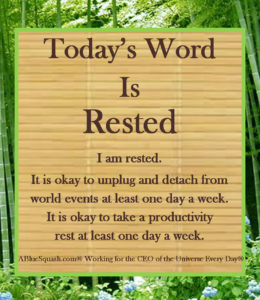 And can’t we all use more rest in this noisy, fast-paced, 24/7 world? Have you ever had a morning similar to this? The other morning I woke up feeling really off. Nothing was wrong, just felt off. Getting ready for work I banged my shin on the edge of the bed frame. Buttoning my shirt a button in a very strategic position fell off. And my hair . . . oh let’s just not go there. Then my husband began telling me about the horrifying news of the day. It made me sad and angry at the way people are treating other people. Went to post the blog for “Today’s Word Is . . . “ and the computer mouse decides to act up. Not just act up; it threw a tantrum of epic proportions. What should have taken me about ten minutes to accomplish took forty-five minutes and there you go, getting to work on time was cutting it too close. Especially when I had to take the time to ponder giving the computer mouse a horrific death. As I’m racing down the street heading for my place of employment, a man in a huge truck looked right at me, pulled out in front of me and slowed waaaay down. He wasn’t even bothering to do the speed limit and traffic was too congested to pass him. I think those kind of people have control issues. Anyhoo, my thoughts were in a terrible place and I caught myself thinking the whole day was going to be ruined, darn it. I can feel as good in this moment as I do on a Saturday when I’m having fun or when I’m on vacation. Or wait, when I’m at Disneyland home of the mouse that would never do something as cheesy as nibble away at my blog posting timetable. Found myself smiling at fond memories of taking my daughter to Disneyland. Soon I was thinking and living out playful cheerful thoughts. I felt more optimistic and knew the rest of the day could be awesome. The truck in front of me turned leaving me a clear path . . . to a red light. That was okay, because in my mind I was in line getting ready to savor a corn dog at Disneyland (which is the BEST on the planet) and contemplating riding the Matterhorn. Eh, what’s a red light? Barely made it to work on time. Everything during the day didn’t go smoothly, yet I felt good. Playful. Full of fun. The people I interacted with picked up on that vibration and life was light and humorous. Once again, the Law of Attraction worked. What you give out is returned to you. The day could have been filled with gloom and doom. Sadness, anger, and yuck. I have absolutely no control over what other people do. I can only control myself and my thoughts. Recalling fun, life-enhancing memories transforms my feelings and brightens the day. Today’s affirmation is, “I am playful and cheerful when I breathe deeply and recall fun memories to take the place of gloomy or dispiriting thoughts. Last Friday’s blog took the second step toward identifying your purpose in life by dissecting your fondest desire. Click here if you didn’t read it. This week’s step is taking the information gathered and turning it into one word. Your purpose is not a mission statement. It is a direction. Your purpose is not a goal. Goals are chosen, created, attained and changed often. A purpose is constant. Yes, we all have a common purpose to love. Yet even the CEO’s handbook says people have different gifts (Romans 12:4-8 KJV). With those gifts we find our purpose in life and spread the love. Now, get out your work from last week. Do you see a pattern emerging? What is the essence of all the activities and qualities? Your inner voice will tell you, “Hey, this is what I’ve always done, it isn’t going away. Every motivation, job, interactions with people this surfaces. Dial it down to one word. Here are just a couple of suggestions; however you have to make your own discovery for the word that best fits your purpose. A lifetime of career, professional, marriage, family, social, spiritual goals, actions, and affirmations can be designed to encompass and align with your purpose. Today’s word is Fearless. I am fearless. I am willing to do the work to discover my purpose and dial it down to one word. This usually means the manufacturer tweaked their product to improve its performance, reliability, or appeal. Sometimes the product is altered for safety reasons. I often looked at myself as a “product” in the business world, especially when I was a job seeker. It was all about performance, reliability and appeal. Making myself noteworthy to an employer. Took college classes, attended workshops, and targeted my reading material to put me on track to be successful in my job or to land a job. Unfortunately I didn’t balance it enough with improving myself for myself and I burned out from attempting to please other people. I could barely reach for my toothbrush, let alone my highest potential. My entire belief system went up in flames as I crashed from mental and emotional exhaustion. This was one of the darkest times during my transformation journey; yet it turned out to be the best of times. Because I had to be willing to take a long and lengthy look at my “product” and investigate why I didn’t take better care of myself so I could reach my highest potential and get the Law of Attraction to work for me in a positive way. Here are some tips on how I changed and am continuing to change my core beliefs. Be open to change. Acknowledge and be willing to admit that there is always room for improvement in the mind, heart, body, soul and spirit. Even people who look like they “have it all” are making adjustments, constantly learning and staying in touch with life coaches or mentors. Louise L. Hay wrote the classic book on transformation and restructuring one’s life. She writes about willingness and the steps to take to peel back layers of resistance. Hay has assisted thousands of people on their path to reaching their full potential daily. Be willing to examine where your core beliefs came from. Question them. Is your belief system out of date? Is it based on other people’s beliefs and expectations? What emotions are attached to the beliefs? Why do you want to change? What will you get out of it? How will changing core beliefs affect your life? 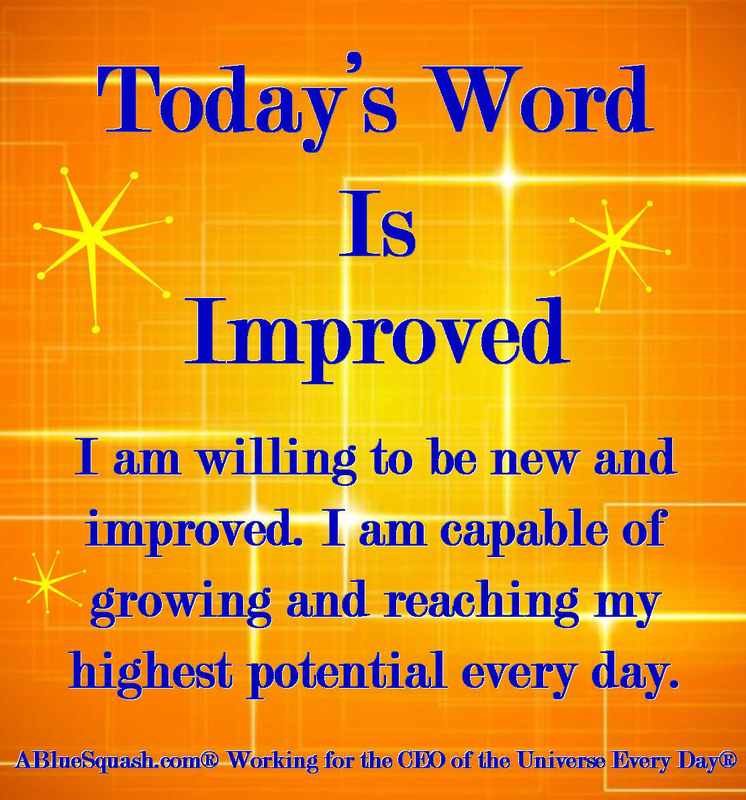 Why don’t you want to become new and improved and reach your highest potential? Many times feelings of unworthiness and fear stop us cold and prevent us from moving forward. A new perspective changes the way you see things. The only way I was able to change my perspective was to ask for help from the CEO of the Universe. You may find other ways to alter your view point. I needed a supernatural power to give me the strength, courage, and wisdom to blast through core beliefs written in stone. Accept that becoming new and improved takes time and energy. Refuse to rush the process. The author of this blog does not presume to offer psychological therapy nor advocates the use of any technique for the treatment of any specific or traumatic psychological condition without the approval and guidance of a qualified psychotherapist. The writer’s intent is to convey personal experience in the hope it may be of help in others’ personal quests for mind, body and spirit improvement. If you use any of the information as a form of self-therapy, the author / writer assumes no responsibility or liability for your actions. 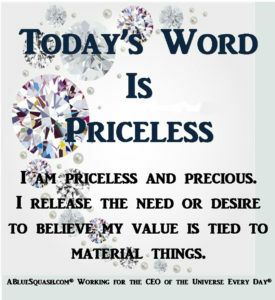 Feeling valuable and precious is so tough for some of us. In the past, I tried to give the impression of being a valuable person, by spending a great deal of time and money getting my hair styled and keeping it that way, working out at a trendy fitness center and choosing the oh-so-right clothes. I couldn’t afford to drive the hottest car or live in a status symbol home; however they were always a part of my goals to achieving a major sense of worth. Alas, no matter what I purchased or how many goals were set and affirmations said, deep down inside, I still didn’t feel satisfied or valuable enough. And that, my friend, is the heart of the matter. I equated my worth and “feeling good enough” with symbols of money and power. For too many years I thought the path to feeling good enough and being really worth something was earning a million dollars or writing a couple of bestselling books. 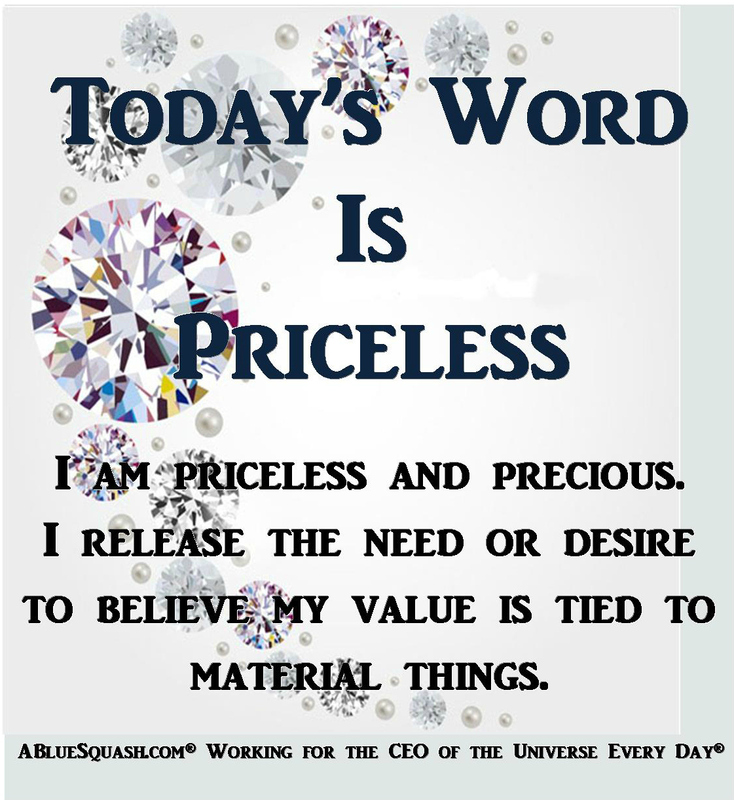 During my transformation journey I discovered that the most powerful being in existence, the CEO of the Universe, didn’t equate my value with material things. If the King of Kings doesn’t look at outward appearances or material things, then why should I? Isn’t the heart far more precious than jewels? How I treat myself and in turn treat other people is far more precious than having expensive things and living a luxurious life. Of course those things would be nice; however, I no longer equate my value with what I have. 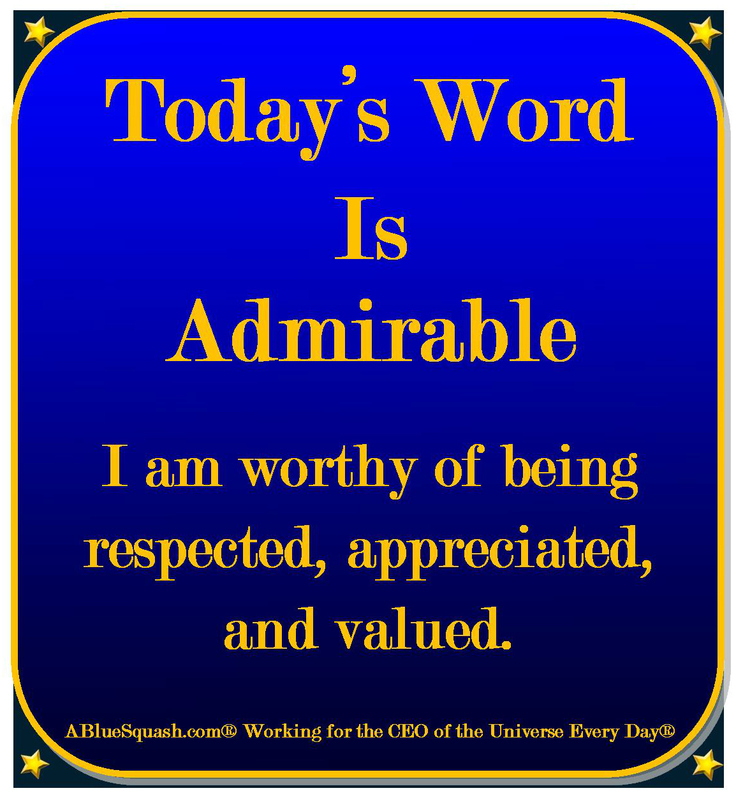 When I decided to work every day for the CEO of the Universe and learn more about how He operates, I finally found my worth.